In the recent years, super-resolution microscopy has gained more and more attention. It has now evolved beyond the stage of development and permits to investigate biological systems that were formerly obscured by the diffraction limit of light. 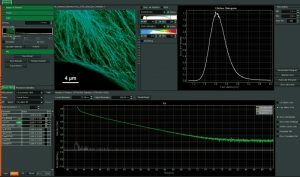 One of the most popular techniques for super-resolution imaging is Stimulated Emission Depletion (STED) microscopy. STED is usually performed with confocal microscopes and is therefore ideally suited to be added to theMicroTime 200. The integration of STED into the system has been driven towards highest robustness and ease-of-use. 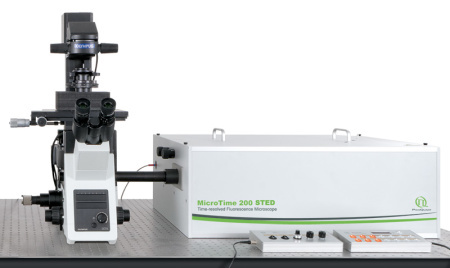 The system permits to perform STED microscopy without lengthy alignment preparations while still having the choice to modify the system and use the full capability of the open microscopy platform MicroTime 200. STED microscopy uses the principle of stimulated emission based depletion. After exciting fluorophores in the laser focus, a second, donut-shaped focus of a laser with longer wavelength is used to actively de-excite the molecules in the periphery via stimulated emission. 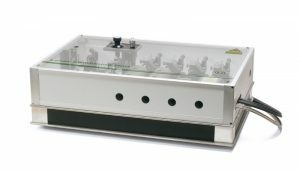 In the MicroTime 200 STED, the donut is created using a so-called EASYDOnut phase plate. It is inserted into the beam path and changes the STED laser focus to a donut-shape, while leaving the excitation laser unaffected. 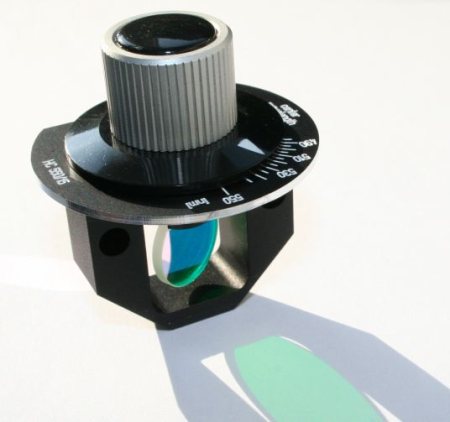 This simple implementation makes spatial alignment of the two laser beams, which emerge from the same optical fiber, unnecessary and yields a spatial resolution of less than 50 nm. Due to the time-resolved data acquisition principle of the MicroTime 200 STED, it is additionally possible to apply time-gates to all measured data. This gated STED (or gSTED) approach leads to an enhanced resolution in images and a reduced observation volume for FCS. 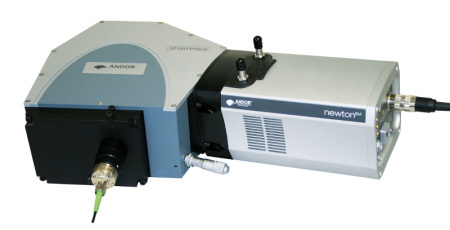 The excitation system of the MicroTime 200 STED is build around a dedicated laser combining unit that integrates the excitation lasers for STED, and the STED laser itself. The standard excitation wavelength is 640 nm, which can optionally be combined with additional lasers at 595 nm and 660 nm for dual species STED imaging. Due to the high power of the invisible STED laser at 765 nm, special care was taken to ensure the userâs safety when operating the instrument. 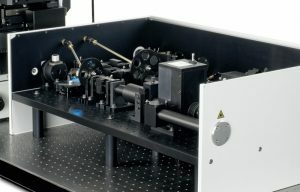 A second laser combining unit with additional pulsed diode lasers can also be attached to the system for non-STED applications such as FLIM, FRET or FCS. The laser power and repetition rate can be flexibly adjusted by the multichannel laser driverPDL 828 âSepia IIâ, which even allows to address several lasers in parallel enabling advanced techniques like Pulsed Interleaved Excitation (PIE). The time delay between the excitation pulse and the STED pulse is adjustable for highest flexibility and best STED resolution. 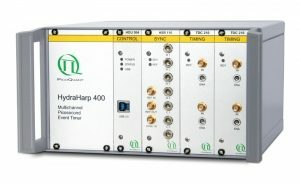 Data acquisition is performed using time-correlated single photon counting (TCSPC) using PicoQuantâs unique time-tagged time-resolved (TTTR) data acquisition mode with picosecond resolution. The acquired TTTR data can not only be used for regular STED imaging, but also to perform gated STED (gSTED) measurements. The advantage of TTTR data acquisition mode is that it allows to perform vastly different measurement procedures besided STED, such as FLIM, FCS, or even coincidence correlation (âantibunchingâ), based on just one fundamental data format. The TTTR format ist supported by all available TCSPC electronics from PicoQuant. The MicroTime 200 STED can not only be used to perform STED and STED-FCS, but also supports all other measurement and analysis procedures available for the MicroTime 200. This includes FLIM, FCS, FCCS, FLCS, FRET,PIE-FRET, or intensity time-traces, to name just a few.